To more effectively represent its international membership, IADC recently appointed Mike DuBose and Bob Warren to leadership positions in the International Development Division. Mike DuBose was named vice president, international development for Europe and Asia and Bob Warren was named vice president, international development, Latin America, Middle East and Africa. Mike began his career with Rowan Companies, as a roustabout in the Gulf of Mexico. Over the following 35 years, he accepted positions with increasing levels of responsibility in the US, UK, Aberdeen and Nova Scotia, all with Rowan. Most recently, Mike served as vice president of drilling operations for Southeast Asia, where he oversaw offshore operations in SE Asia. Under his watch, 4 jack-up units were successfully employed offshore and the regional safety record for year-end 2012 was a company best of 0.46 TRIR. Mike received a master of science degree from the University of Aberdeen and is a task force member for the Center for Offshore Safety Task Force. Bob began his career in West Texas as a roughneck. Over the following 38 years, he held operations and management positions in various countries in the Middle East, North Africa, South America and the former Soviet Union. He recently completed 20 years in executive positions with Pride International. Since retiring from Pride (now Ensco plc. 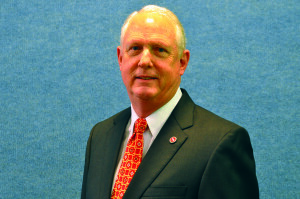 ), Bob has been advising IADC leadership regarding Committee realignment. He holds a BSc in Petroleum Engineering from Texas Tech and an MBA from The University of Texas at Austin. “After more than 20 years with IADC, I will be retiring on 15 October,” said Ken Fischer, IADC Vice President, International Development. 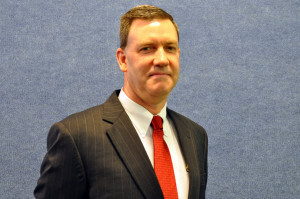 Mike DuBose can be reached via email at Mike.Dubose@iadc.org. Bob Warren can be contacted via email at Bob.Warren@iadc.org. ervicing positions that require KSAs, and will be responsible for developing core competencies for each. In the future, the group plans to develop KSAs for coiled tubing, wire lines and trucking. The well servicing KSAs are expected to be completed by mid- to late 2014. These will be added to the IADC KSAs for the drilling industry, scheduled to be completed later in 2013, which focus on drilling onshore, drilling offshore, subsea operations, marine operations, technical maintenance, QHSE/process and regulatory, procedures and facility management. The group invites further participation from interested members. They will hold their next meeting on 23 September in Houston. For more information, please contact Scott Maddox at ext. 423 (scott.maddox@iadc.org). Early September saw the beginning of a new era for the IADC Brazil Chapter, with the presentation of the first in a series of workshops to encourage local companies, and international companies present in Brazil, to participate in forums to improve the oil and gas industry within the region. The first of these workshops, simply titled “Safety Workshop” was held on the 4-5 September at the Transocean training facility in Macae. 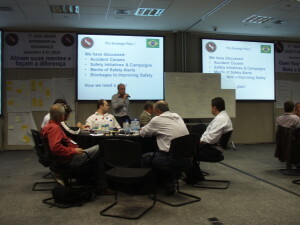 The goal of the workshop was to establish an IADC Safety Committee in the Brazil region, and to establish topics and targets for the committee to work towards. The workshop included both discussion groups and presentations on topics such as Step Change in Safety, a UK initiative with a strategic 5-year plan to improve safety performance within the UK Sector; IADC Competency development programs; and successful implementation of a Fast Track program by a North Sea drilling contractor. Discussion groups confirmed that competency development continues to be a major challenge within the industry. Mark Denkowski, IADC Vice President of Accreditation and Credentialing presented IADC Competence Development programs and provided updates on KSAs (Knowledge, Skills, and Awareness) initiatives underway by IADC committees worldwide. The workshop was well attended by approximately 80 people, representing 95% of drilling contractors operating in Brazil, several of the major operators, and many service companies. The group included drilling contractor operations managers, rig managers, safety technicians and managers, lawyers and training managers. This diversity allowed for broad and open discussions on all levels. IADC Vice President of International Development, Bob Warren, commented that the workshop was a great success and had achieved its goals to establish a regional safety committee and set initial targets for it to achieve. Now that the committee is formed, he looks forward to working with Chapter members and IADC regional representative Tony Cox to ensure that continuous support is available. 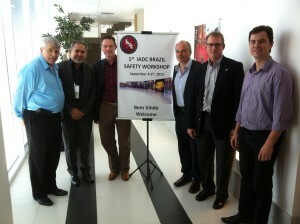 Members attend the IADC Brazil Chapter Safety Workshop. L to R: John Guy, Chapter Secretary; Joao Cabral, Petrobras; Tony Cox, IADC Brazil Regional Director; Hugh Oliver, Chapter Vice President and Event Coordinator; Mark Denkowski, IADC VP Accreditation and Credentialing and Rogerio Furtado, Chapter President. Representatives of the Agencia Nacional de Petroleo (ANP) were unable to attend the workshop but expressed a sincere interest in the development and success of the safety committee. Chapter members have been given the opportunity to present the detailed results of the workshop to ANP in early October. IADC Brazil Chapter VP of Technical Presentations, Hugh Oliver, indicated that the next workshop, slated for Q4 2013 or Q1 2014, will be targeted to include equipment suppliers as well as drilling contractors and operators. Participants will investigate the common causes of down time in drilling operations, identify ways to remove blockages and share the best technical solutions known today. Future workshops will be planned to understand the limitation of the infrastructure on operations, with the intent to get more efficiency out of the current infrastructure and to detail the future growth and impact on our operations. Please visit the IADC Brazil Chapter website to learn more about upcoming activities and to get involved. For more information, please contact Tony Cox at Tony.Cox@iadc.org. The IADC UBO/MPD training subcommittee is currently developing a training syllabus for the IADC well control accreditation program for underbalanced operations. The syllabus will consist of core curriculum for fundamental and supervisory levels that includes training topics and learning objectives. The fundamental course is being designed for the rig crew and will focus on equipment, operations and procedures. The supervisory course will be for the driller, toolpusher, superintendent and onsite- drilling consultant and will focus on underbalanced drilling designs, calculations and well complications. Fundamental differences between underbalanced and conventional drilling hydraulics. Making trips, completions, logging and connections. For more information on the syllabus and the work of the subcommittee, including how to get involved, please contact Scott Maddox at ext. 423 (Scott.Maddox@iadc.org). On 22 August, the Bureau of Safety and Environmental Enforcement (BSEE) proposed amendments to the Oil and Gas and Sulphur Operations on the Outer Continental Shelf – Oil and Gas Production Safety Systems regulations. The bulk of the proposal addresses issues such as the safety and pollution of prevention equipment lifecycle analysis, production safety systems, subsurface safety devices and safety device testing. The proposed rule would also revise the requirements for employing Best Available and Safest Technology (BAST) for new drilling and production operations, removing a long-standing regulatory presumption that the BAST requirements of the OCS Lands Act would be generally satisfied by compliance with BSEE’s regulations. Administration of the proposed revision, if adopted, will introduce additional uncertainty regarding the ongoing qualification of any rig for operations on the U.S. OCS. On 29 August, IADC requested an extension of the comment period, noting that the implications of this proposed changes to the BAST requirement are not clear, particularly given the fact that the current regulatory provisions have been in place since 1978. IADC understands that BSEE will be extending the comment period until mid-December 2013 to allow more time for industry to develop a response to the proposal. For more information, please contact Mr Spackman at ext. 207 (Alan.Spackman@iadc.org). In 2012, the US Bureau of Land Management (BLM) released a proposed well stimulation and hydraulic fracturing regulation for Federal and Indian lands. The intent of the rule is to ensure that the hydraulic fracturing process does not contaminate groundwater. After receiving more than 170,000 comments on the proposed rule, the BLM issued a supplemental proposal in May 2013. On 22 August, IPAA, IADC, The Western Energy Alliance, the Association of Energy Service Companies, the International Association of Geophysical Contractors, the Petroleum Equipment Suppliers Association, the US Oil & Gas Association and 41 other organizations submitted comments to the BLM regarding the revised rule. The associations contend that the BLM’s proposal is technically unsound and does not provide any benefits that the already-existing regulations currently provide. The rule imposes costs that are not commensurate with any benefits the rule might provide and are in many cases duplicative of States’ efforts to regulate oil and natural gas. In the letter, the associations contend that the usable water definition contained in the rule creates confusion for an existing regulatory structure, that the state/tribal or basin variance language is flawed and that the economic analysis is inadequate and the rule is arbitrary and capricious. For more information, please contact Brian Petty at Brian.Petty@iadc.org. In the 5 June 2012 Federal Register, FMCSA issued notice of regulatory guidance regarding the Hours-of-Service (HOS) requirements for oilfield operations. In the 12 August 2013 Federal Register, the agency announced its decision to retain the 2012 guidance. In this notice the Agency announced that it will continue to monitor the use of the two HOS oilfield exceptions in 49 CFR 395.1(d). Motor carriers that believe the current oilfield operations exceptions do not provide sufficient relief for their operations should consider submitting an application for an exemption to the agency. Refer to 49 CFR Part 381 for information on the application process. The 2012 Regulatory Guidance and the recent announcement mean if you do not service the well with anything “down hole”, then you do not qualify for the waiting time exception. Companies such as sand and water haulers, suppliers and rig movers can no longer use the waiting time exception. In order to claim the exception, companies also cannot operate on 12-hour shifts and cannot perform any other duties while waiting at the wellsite. Additionally, the exception cannot be used if your operators drive their truck to location, position it on-line, get out and start performing ground work, hold a pre-job meeting and then start the job. Well service companies should carefully assess activities logged as “off duty waiting” time. DOT officers and state troopers are being educated on the application of the rule and are learning the questions to ask and how to correctly assess oilfield equipment for its application at the wellsite. All companies are highly encouraged to educate their drivers on how to correctly answer questions from troopers concerning their daily activities on location. If your company qualifies for the “waiting time exception”, you are encouraged to submit a signed letter to FMCSA outlining your methods of operation and the equipment you are using. The FMCSA has also indicated that photos of the equipment and its applications are helpful. Letters to the FMCSA should be sent to Larry W. Minor at the address listed below. For more information, please contact Paul Breaux at ext. 227 (Paul.Breaux@iadc.org). The IHS recently issued the results of their study, “America’s New Energy Future: The Unconventional Oil and Gas Revolution and Economy – Volume 3: A Manufacturing Renaissance.” The study examined economic activity resulting from unconventional development, from drilling and refining to petrochemical supplies and manufacturing. The study found that the full unconventional value chain supported 2.1 million jobs in 2012, and generated nearly $75 billion in federal and state tax revenues, contributing $283 billion to the US gross domestic product. By 2020, it is projected that these economic contributions will grow to 3.3 million jobs, more than $125 billion in federal and state tax returns and more than $468 billion in annual contributions to the US gross domestic product. Supported $150 billion in earnings for US workers in 2012, and projected to rise to $269 billion by 2025. To access a PDF copy of the full report, please visit the API website. The International Association of Oil and Gas Producers (OGP) recently published a new report from the Health Committee on prevention of heart attacks and other cardiovascular diseases. The guide is intended for managers, employees and company health professionals and provides information related to heart attacks and strokes related to cardiovascular disease (CVD), which are the main causes of death in the oil and gas industry. The report supplies information on the main types of CVD’s and their causes and symptoms while also looking at their implications for the industry. The guide offers strategies and improvements that can be implemented to help reduce the number of CVD deaths in the future. To access the full report, download the PDF at the OGP website.